Port or mulled wine? Mince pies or gingerbread? One of the best things to do in the festive season is to visit a Christmas market. Get into the festive spirit by sampling delicious Christmas fare, heart-warming drinks and delightful carols. Here are a few tips on where to enjoy the best Christmas markets in Europe. During the weeks leading up to Christmas, Copenhagen’s famous amusement park, Tivoli, is transformed into one of Europe’s most enchanting Christmas markets. Surrounded by Christmas trees adorned with a myriad of sparkling lights, here you’ll find an abundance of tasty fare and exciting gifts, getting you right in the mood for Christmas. The day after your visit to the Christmas market, we recommend a traditional Danish Christmas breakfast (which, in fact, is actually a Christmas lunch), with lots of tasty treats such as caramelized potatoes and crispy pork rinds. Restaurant Kronborg, in the heart of Copenhagen, is one of the places where these delicious Christmas breakfasts are served. Planning to stay in the Danish capital for a few days? Book a package trip to Copenhagen with Norwegian Holidays. One of the truly classic European Christmas markets is found in the old town of Prague. In the market square, by the famous Astronomical Clock, that Christmassy feeling will come over you before you know it. Enjoy a hot drink and burnt almonds as you browse the many wooden stalls that surround the great Christmas tree in the middle of the square. Here you can buy hand-made goods from all over the Czech Republic. Glass ornaments, toys and jewellery are among the trinkets you’ll find in abundance. Many of the stalls also sell local fare such as black pudding and a variety of pork dishes which will really warm you up as you browse this outdoor market. Looking to book a flight and hotel in Prague? Norwegian Holidays offers package holidays in Prague so you can save time and book everything together. On the eastern shores of the Baltic lies Latvia, with its beautiful capital of Riga. The Christmas market there is located in the cathedral square, in the heart of the historical town centre. Here, you can buy wax candles and wooden candlesticks, the perfect gift from your travels. The Latvians are fond of knitting, so you’ll also find a wide range of homemade woollen products. Don’t forget to enjoy a glass of mulled wine, munch on a gingersnap or try the smoked meats on sale at a variety of venues. You can find affordable package holidays in Riga, which include flights and accommodation. Treat yourself to a festival of light in Poland’s impressive Baltic port. In the centre of Gdansk, you’ll be met by a veritable ocean of spectacular Christmas lights, a skating rink, a small funfair and, of course, everything you can expect from a Christmas market. Catholicism is predominant in Poland, which is reflected in Gdansk’s Christmas market. You can expect nativity scenes, a variety of beautifully designed Bethlehem cribs and the opportunity to witness an authentic Catholic Advent service. Hotel prices in Gdansk are low, and the same applies to restaurants, so this makes for a good festive break if you’re on a budget. Why not book a package holiday in Gdansk with Norwegian Holidays and enjoy this magnificent Baltic city? We couldn’t write about European Christmas markets without including Berlin. There are lots of markets to enjoy in Berlin, but the biggest and best takes place in Gendarmenmarkt from around 24 November all the way through to New Year’s Eve. Here, you can buy lots of lovely Christmas decorations in addition to souvenirs and homemade clothing. The Berliners are great cooks, and there are plenty of Wurst on offer. Of course, you must wash them down with a mug of hot Glühwein. There are heated tents in the market to help you keep warm, as Berlin can get quite chilly in December! While in the German capital, you can also enjoy a visit to the Christmas Garden at Berlin’s Botanical Garden. This trip is ideal if you’re travelling with kids, as the garden takes the form of a fairy tale wonderland with spectacular illuminations, magical woods and enchanting light sculptures. Need more inspiration for your trip? Check out the top 10 things to see and do in Berlin. Christmas markets are arranged at several venues in Budapest towards the end of November. Best known of these is the one in Vörösmarty Square in the city centre. Here, you can buy all kinds of Christmassy things from over 100 stalls, including high-quality crafts from decorative baskets to folk music instruments. While you’re there, don’t forget to try out some Hungarian delicacies like kürtőskalács chimney pastries, mutton and paprika cream sandwiches, and freshly-made punch. You can have a pleasant stay for a reasonable price in Budapest. Check out prices for package holidays in Budapest with Norwegian Holidays. Britain’s capital city offers a wide range of Christmas markets. You’ll soon get right into the Christmas spirit here, with lots of magnificent decorations, ice-skating rinks, the chance of trying out all sorts of tasty Christmas dishes and, of course, the opportunity to do lots and lots of shopping. An institution among London’s Christmas markets featuring traditional market stalls, twinkling lights and lots of lovely decorations. There’s also plenty of family activities here such as a turn-of-the-century circus show featuring puppets, free workshops, storytelling and much more. A sizeable Christmas market which spans Hyde Park, with merry-go-rounds, lots of decorations and a large ice-skating rink. Admission to the market is free, but you’ll need to buy tickets for access to certain parts of the grounds. A large, indoor Christmas workshop and market which focuses on design and creativity. Here you can make or buy Christmas presents, while keeping the cold at bay. Located in the Olympia London exposition centre. Leicester Square’s Christmas market is situated in the heart of London, in the middle of Soho. This is a traditional Christmas market with handcrafted gifts, festive decorations and warming winter fare. Here you can also catch a variety of special Christmas performances. London’s most unconventional Christmas market, Winterville, is found on Clapham Common. The programme includes DJs, magicians, and the chance of watching a Christmas show for the whole family that takes place on board a double-decker bus! Sightseeing on a shoestring this Christmas? Check out our tips for visiting London on a budget. 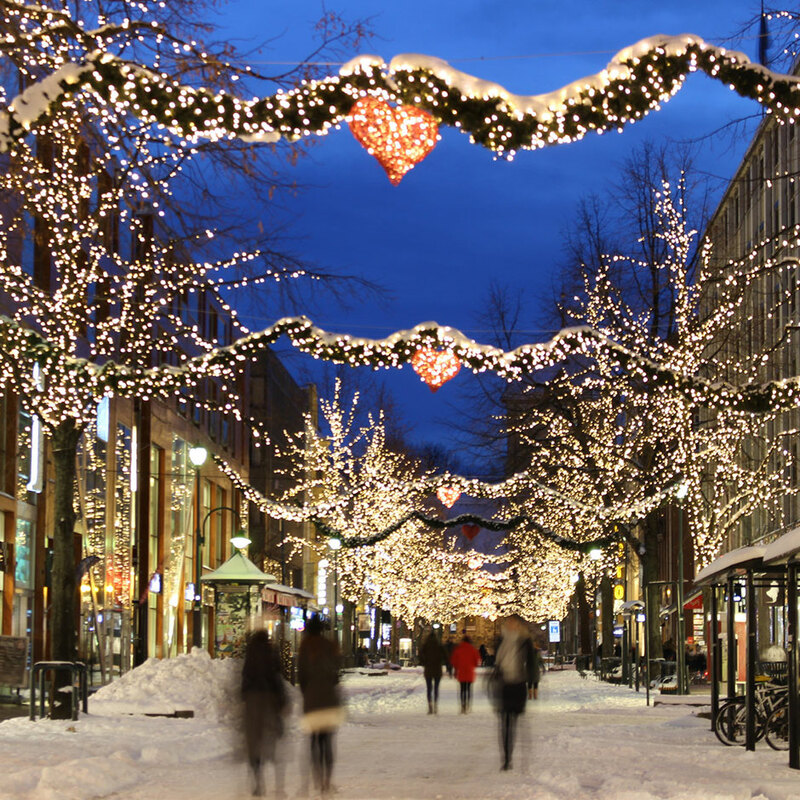 The Christmas market in Midtbyen, Trondheim, is an annual event with over 75 exhibitors. The market is open from 7 to 19 December. Here you can enjoy an authentic Norwegian Christmas, with local fare, handicrafts and the traditional Christmas tree. It’ll be a bit chilly outside but the atmosphere here is wonderfully festive with various concerts and plays for guests to enjoy.